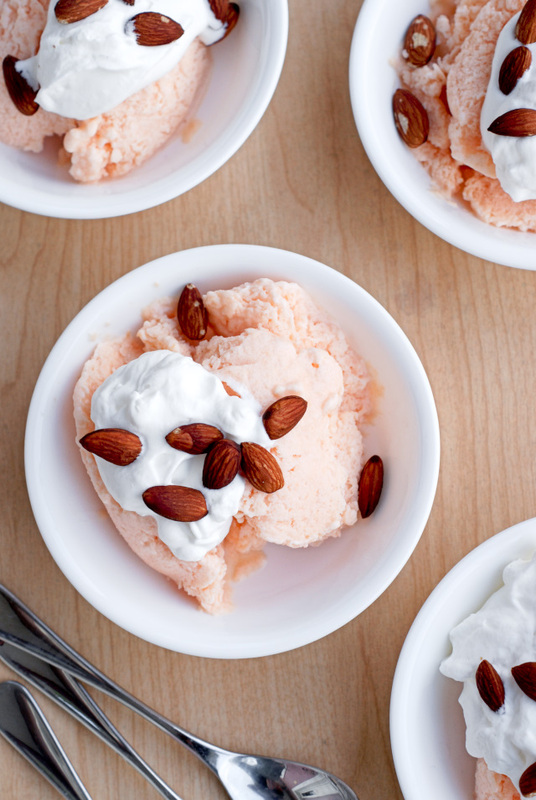 Cantaloupe, White Wine, and Ricotta Ice with Roasted Almonds is a cool, crisp and elegant dessert that is perfect topped with a dollop of fresh whipped cream. So, when you read the title of this recipe, were you confused? I mean, do white wine, cantaloupe and ricotta even belong in the same sentence? I am here to tell you that yes, yes they indeed do. There is something very light, very fresh, very crisp about this not too sweet icy dessert. It has a kind of understated elegance. Maybe it's because of the wine. Or maybe it's the fresh whipped cream. Perhaps it's the dark, fragrant, crunchy almonds on top. Who knows. All I do know is that I loved it! This recipe came to be when I was browsing the world wide web trying to decide what I should with a half of a cantaloupe in the fridge that was asking for some love. Sure, I eat fresh cantaloupe, but I was feeling inspired to get a little crafty with the half I hadn't eaten yet. I've made Cantaloupe Popsicles before, but I was looking for something a little different. I'd say adding ricotta cheese to your dessert is a little different, wouldn't you say? But, sweetened ricotta works! I promise. It is lightly sweet and completely refreshing. 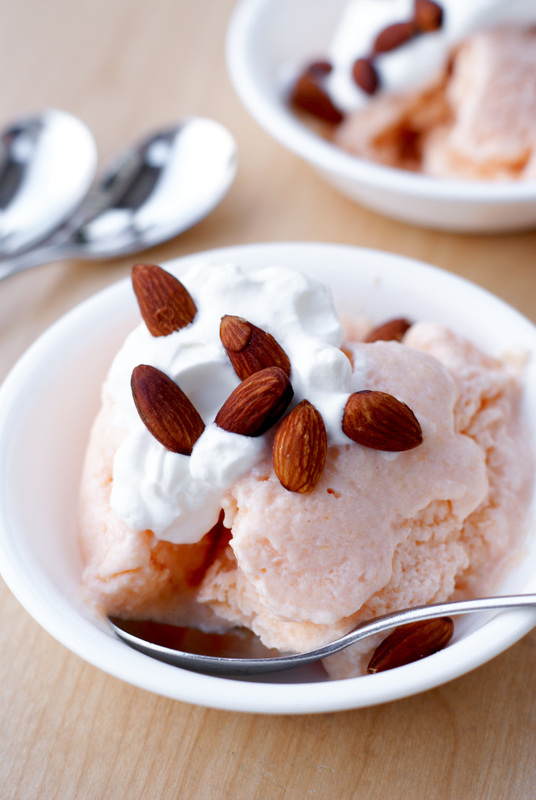 The icy texture pairs just perfectly with the creaminess of the fresh whipped cream and the roasted almonds - I implore you to use roasted almonds here - are the perfect crunchy finish! In a blender or food processor, blend the ricotta, cantaloupe, white wine, and vanilla. (I used my immersion blender.) Pour the mixture into a 1-2 inch deep dish. Freeze for at least 3 hours. Place mixing bowl and beater into the freezer for at least 10 minutes. When nice and cold, add the whipping cream and sugar to the bowl and beat until the cream has stiff peaks. Scrape the cantaloupe mixture out of the dish with a large spoon and divide into 6 bowls. 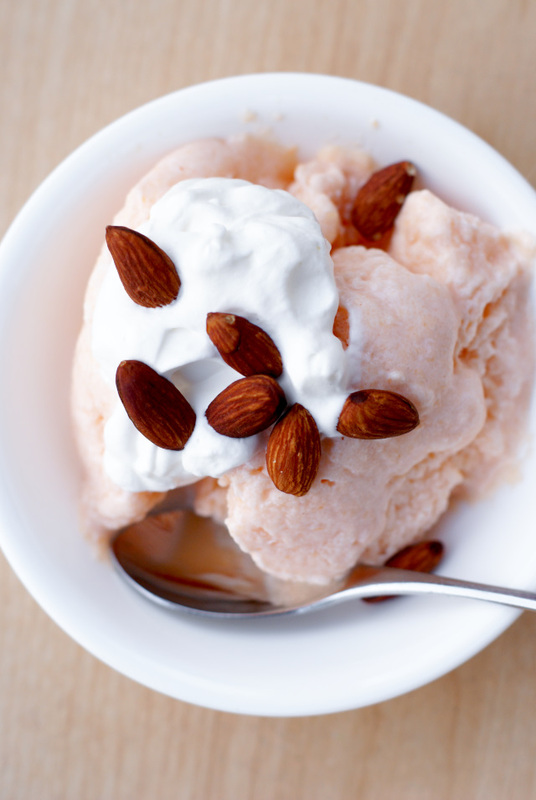 Top with the whipped cream and roasted almonds. Serve immediately. Easy Roasted Almonds: Preheat oven to 350 degrees. Toss almonds with a few drops of olive oil, spread them onto a baking sheet, and roast for 8 minutes, stirring halfway through cook time. Source: Adapted from Quincaillerie Dante.